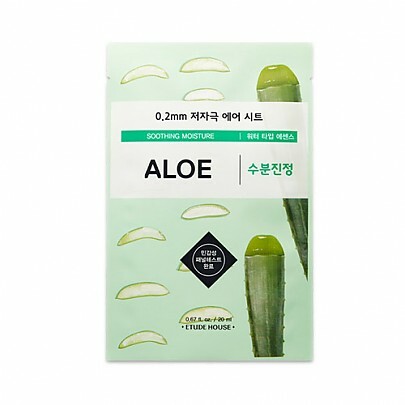 ETUDE HOUSE 0.2 Therapy Air Aloe Mask soothes and restores stressed skin by using Aloe Vera Extract that provides rich hydration and has healing properties. Suited for all skin types. Best suited for dry or sensitive skin. This is a thin sheet mask that is soaked in a light essence consisting of Aloe Vera Extract. It will promote skin cell regeneration and moisture absorption. Aloe Vera Extract also instantly relieves irritations, redness as well as helps heal blemishes faster. Etude House Therapy Air Mask Aloe leaves your skin feeling calm, smooth and supple in 10-15 minutes. Aloe Vera Extract 2,500ppm – delivers moisture which the skin absorbs 4x quicker than water. Most commonly used for soothing irritations, sunburns and inflammations and relieving redness. See our whole ETUDE HOUSE range here. Water,Glycereth-26,Dipropylene Glycol,Propanediol,Alcohol,Hydroxyethyl Urea,Butylene Glycol,Glycerin,1,2-Hexanediol,Aloe Barbadensis Leaf Extract,Sodium Carbomer,Allantoin,Hydroxyethylcellulose,Glycyrrhiza Glabra (Licorice) Root Extract,Coptis Japonica Root Extract,Zingiber Officinale (Ginger) Root Extract,Camellia Sinensis Leaf Extract,Dehydroacetic Acid,Sodium Hyaluronate,Disodium Edta,Dipotassium Glycyrrhizate,Polyglyceryl-10 Laurate,Polyglyceryl-10 Myristate,Caprylic/Capric Triglyceride,Boswellia Serrata Gum,Beta-Glucan,Hydrogenated Lecithin,Lavandula Angustifolia (Lavender) Oil,Eucalyptus Globulus Leaf Oil,Geranium Maculatum Oil,Citrus Nobilis (Mandarin Orange) Oil,Citrus Limon (Lemon) Fruit Extract,Pinus Palustris Oil,Phytosteryl/Octyldodecyl Lauroyl Glutamate,Ceramide Np.